Interstellar is a 2014 epic science fiction film directed by Christopher Nolan and starring Matthew McConaughey, Anne Hathaway, Jessica Chastain, and Michael Caine. 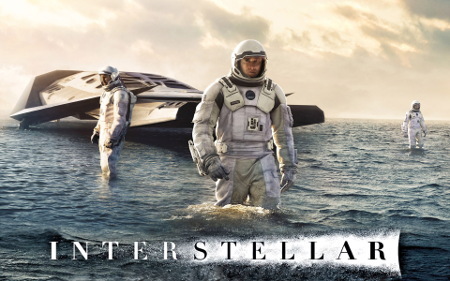 The film features a crew of astronauts who travel through a wormhole in search of a new home for humanity. Brothers Christopher and Jonathan Nolan wrote the screenplay, which has its origins in a script Jonathan developed in 2007. Christopher Nolan produced the film with his wife Emma Thomas through their production company Syncopy and with Lynda Obst through Lynda Obst Productions. Caltech theoretical physicist Kip Thorne, whose work inspired the film, was an executive producer and acted as scientific consultant. Weird effects in end and glorious stuff in beginning is what i remember the most from watching this film. Also weird black hole and wormhole physics do not diminish from your need to watch this if you like space or science fiction films. Matthew is mostly great performer, so he is here which is important because he is in center of camera focus most of the time. I do recommend watching this even if you will hate pathetic interpretation of spooky action on distance. I give this solid four in this little list of ours. Solve this complex math: 7 + 8 = ?